One of the most important things that church members and visitors are looking for is effective and engaging leadership in a church. Leadership in churches is about far more than just a title. It’s about how leaders engage with the church community. It’s the leaders that inspire members to keep coming back and help grow the church. Without the right leaders, it’s difficult for a church to continue to thrive for generations. Church isn’t the same as it was 100 years ago. As times change, so do churches. However, there is always some hesitance from long-term members. For instance, taking your church online isn’t always going to be well-received by older members of your church family that may not even have a computer or smartphone. Leadership in churches is crucial for effectively guiding the community through changes. Leaders help explain the what, why and how in a way that eases the transition and involves everyone in the process. One of the most important jobs of church leaders is to encourage and motivate members, staff and visitors. Leaders keep everyone focused, encourage conversation, explain why things happen and build excitement. When a member is feeling lost, leaders are able to understand their concerns and inspire them. It’s not always an easy task, but it’s one of the traits of a highly effective church leader. Some people are leaving the church because they don’t feel it meets their spiritual needs. Leadership in churches means paying close attention to church members and noticing when they don’t seem engaged. It’s up to leaders to question what’s wrong and talk to members, other leaders, and first-time visitors to see where they can improve. Without the right leadership, the community doesn’t get what it truly needs and that’s key to keeping members and increasing membership. Church isn’t just a weekend activity. It’s the job of church leaders to continue with ministry throughout the week. This keeps the church family focused and engaged. From visiting the sick to posting messages on social media, it’s important for leaders to show their members that church doesn’t have to be just something that happens on Sundays. Effective leadership also inspires volunteers to help out. From writing blog posts and responding to questions on the church’s website to being a shoulder to cry on during difficult times, these motivated volunteers continue the work of church leaders, allowing for a wider reach all week long. Bringing in and engaging new visitors isn’t always easy. Leadership in churches means bringing current members together to be a welcoming presence while making an effort to speak with new visitors about their needs. The right leadership works with existing members to create a more effective strategy for encouraging new visitors. Leaders also have to understand emerging and current trends, such as marketing the church online, in order to stay in contact with potential members. By far, the most important reason for leadership in churches is to bring the entire church family together as one. When members, staff, and random visitors aren’t all on the same page, it’s nearly impossible to keep everyone engaged and active. Instead, you notice membership becoming more random, members unable to get along and more members questioning their own faith. It takes strong leadership to bring so many different people together. Even with a small ministry, you have dozens of people from varying backgrounds. Getting them all to come together under one roof to explore their faith isn’t easy. Effective leadership is what keeps a church together and working as a single community. Want to lead your members all week and grow your community at the same time? 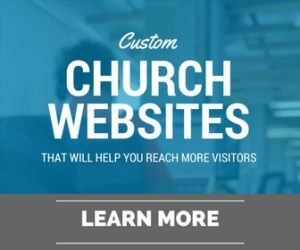 Find out how a church website can help.